Apollo 12s S-IVB stage during transportation on a Super Guppy aircraft. developed, and while the other two stages faced formidable engineering problems, neither caused the headaches that the S-II brought onto managers at NASA and North American Aviation, the company that won the contract to build it. The stage not only had to carry cryogenic propellants, it was large, matching the 10-metre diameter of the S-IC, and was nearly 25 metres long. Additionally, because the other two stages were much further along in their design cycles, there was a tendency for mass reductions to be demanded from the S-II. 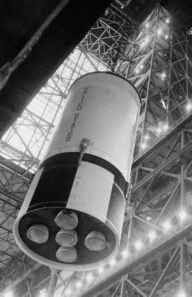 The decreasing mass of the stage during development led to the destruction of two stages during testing and, for a while, the S-II became the pacing item in the race for the Moon. 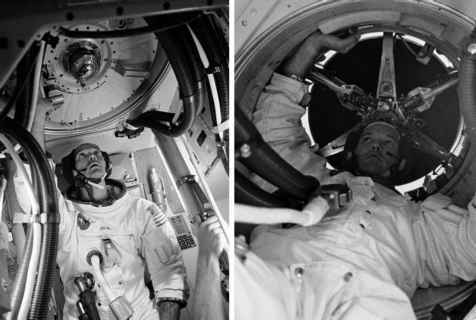 Scathing reports on the management style of North American - which was building the S-II as well as the Apollo spacecraft - came close to ending the Apollo programme in the wake of the Apollo 1 tragedy. Apollo 10's S-II stage about to be strength when chilled by Hquid hydr°gen. added to the outside, which was a difficult task when the adhesive had to work at 20 K. Gaps between the insulation and the tank wall could not be tolerated in case the air within froze and caused the panels to loosen or fall off. Eventually, an arrangement of grooves within the insulation was implemented which was purged with helium (which would not freeze as air would) throughout the loading of the fuel. The stage carried five non-restartable J-2 engines which produced a combined thrust that could balance 520 tonnes.